This tangy lemon sauce gives the dish a very oriental feel. Preheat the oven to 190°C/325°F/Gas Mark 5. Peel the potatoes and cut into medium sized chunks. Place the potatoes, lemon zest, oil and mixed herbs into a large bowl and mix well. Place on a flat baking tray, lined with parchment paper and transfer to the oven for 30-35 minutes. 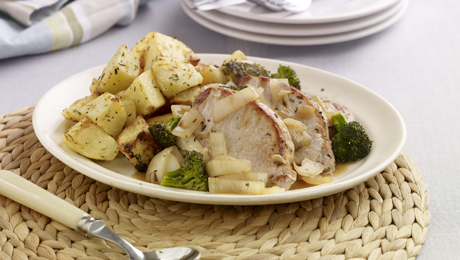 Place the pork medallions into a small mixing bowl with the zest of 1 lemon, the dried mixed herbs and the oil. Leave to marinade for at least 20 minutes. Next begin making the tangy lemon sauce. Place the lemon juice, honey and water into a medium sized saucepan and bring to the boil. In a separate bowl dissolve the cornflour with a little cold water and mix well. When the sauce has come to the boil, whisk in the dissolved cornflour and continue to whisk. Meanwhile heat a large pan and sear the pork medallions on either side for approximately 2-3 minutes on each side depending on their thickness. Remove from the pan and keep to the side for a couple of moments. Add a little more oil to the pan, add in the onion and garlic and the spears of broccoli and cook these for 3-4 minutes also. When these have softened, return the pork to the pan, add in the lemon sauce and mix well to bind the mixture together. Taste the dish, and correct the seasoning if required and serve with the lemon potatoes.